Banks in New York are denying more housing loans in neighborhoods where people of color dominate, and are turning down black applicants who seek mortgages and refinancing at a higher rate than similar white applicants, an advocacy group reported this week. 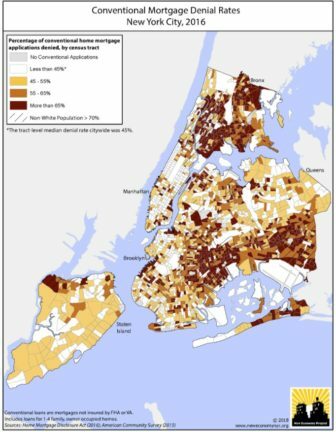 The New Economy Project looked at denial rates for conventional mortgages—those without Federal Housing Authority or Veterans Administration insurance, and the bulk of home loans in New York City—in 2016 and found that “three out of four neighborhoods where lenders denied more than half of applications received were communities of color.” The higher the share of non-whites in an area, the organization reported, the higher the denial rate. Even when “controlling for income, loan size and other factors,” Black applicants were twice as likely as Whites and Latinos 1.5 times as likely as Whites to be denied for home loans, with similar disparities evident in the numbers for refinance applications. 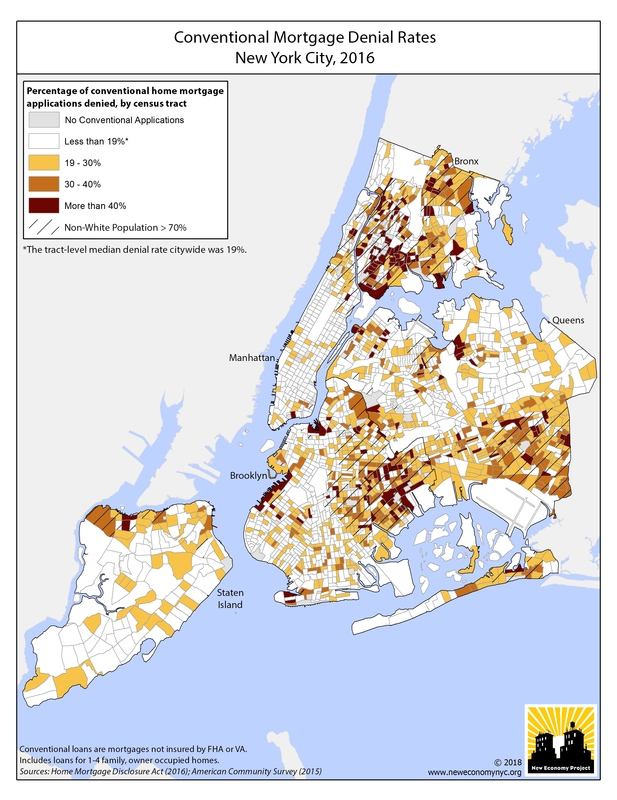 A map produced by the group shows the highest denial rates in areas like Wakefield (which is largely Black) and the central and south Bronx, eastern Brooklyn and southeastern Queens. There are also pockets in the Rockaways, Flushing, Sunset Park and the north shore of Staten Island. The report comes amid word that President Trump is seeking to amend the CRA, which for four decades has required banks to demonstrate that they invest—i.e., loan money—in the neighborhoods from which they accept deposits. CRA is one of the federal government’s most important tools to prevent redlining, or the denial of credit to neighborhoods where people of color dominate. During the New Deal, the federal government—using color-coded maps in which “no go” areas for lenders were marked red—pursued an overtly racist approach to mortgage financing. Its effects still reverberate in vulnerable neighborhoods and in the startling wealth disparities between white families and virtually everyone else. The Senate and Assembly banking committees have both approved a bill to permit check-cashing outlets to provide short-term loans. Backers say it offers financing to those whom regular banks don&apos;t serve. Critics say it would permit exploitative “payday” lending. 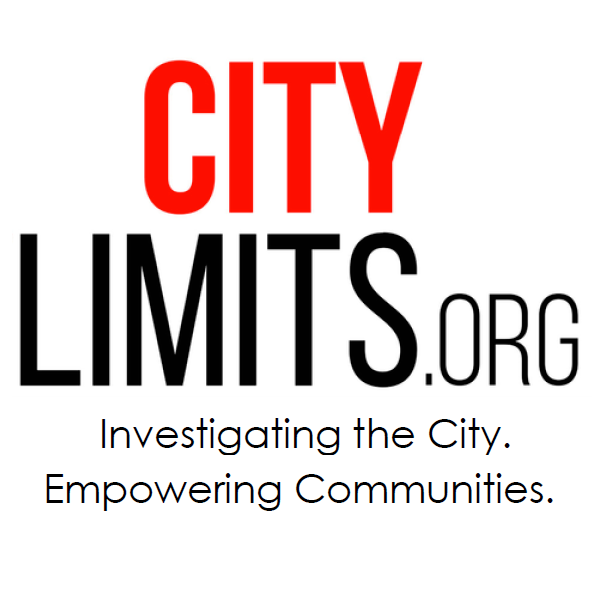 In addition to shoddy mortgages, deed theft and usurious payday loans, there’s another predator sucking money out of low income neighborhoods of color: debt buyers. According to a study released this week by the Neighborhood Economic Development Advocacy Project these firms – which buy credit card, fines or other debts with the aim of collecting them from debtors – regularly file fraudulent lawsuits against low income, elderly and disabled New Yorkers.